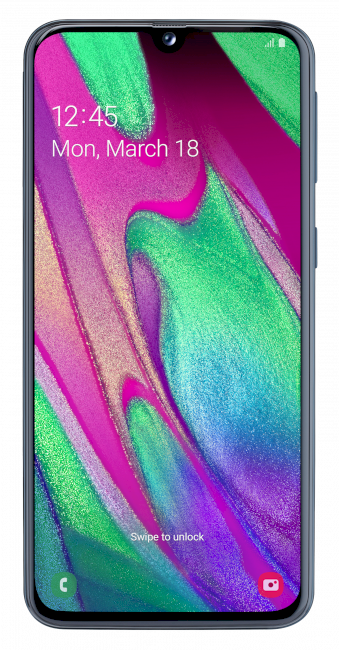 Samsung's Galaxy A40 SM-A405F specifications and features: this is a 5.9"(149,8mm) device with a FHD + 1080x2340 screen resolution. The phone is powered by the Exynos 7885 soc with a Dual-Core 1.8GHz & Hexa-Core 1.6GHz configuration. Memory is 4GB, with the device offering 64GB internal storage and up to 512GB of external memory. The Galaxy A40 features Accelerometer, Fingerprint Sensor, Gyro Sensor, Geomagnetic Sensor and Hall Sensor. The device measures 144.4 x 69.2 x 7.9mm and weighs 170g.